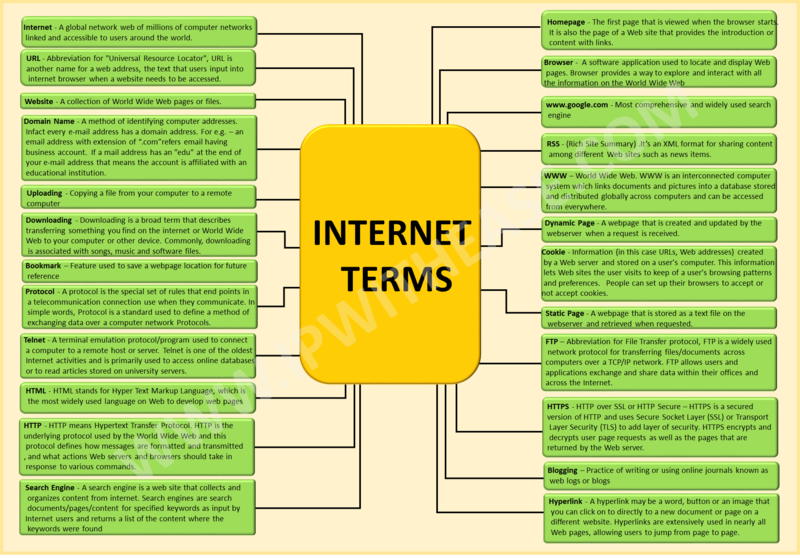 Internet – A global network web of millions of computer networks linked and accessible to users around the world. Website – A collection of World Wide Web pages or files. RSS – (Rich Site Summary) .It’s an XML format for sharing content among different Web sites such as news items. Homepage – The first page that is viewed when the browser starts. It is also the page of a Web site that provides the introduction or content with links. 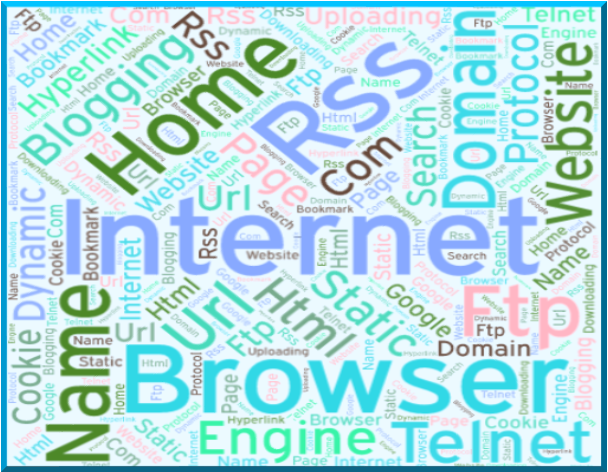 Domain Name – A method of identifying computer addresses. Infact every e-mail address has a domain address. For e.g. – an email address with extension of “.com” refers email having business account. If a mail address has an “edu” at the end of your e-mail address that means the account is affiliated with an educational institution. WWW – World Wide Web. WWW is an interconnected computer system which links documents and pictures into a database stored and distributed globally across computers and can be accessed from everywhere. Dynamic Page – A webpage that is created and updated by the webserver when a request is received. Static Page – A webpage that is stored as a text file on the webserver and retrieved when requested. FTP – Abbreviation for File Transfer protocol, FTP is a widely used network protocol for transferring files/documents across computers over a TCP/IP network. FTP allows users and applications exchange and share data within their offices and across the Internet. Telnet – A terminal emulation protocol/program used to connect a computer to a remote host or server. Telnet is one of the oldest Internet activities and is primarily used to access online databases or to read articles stored on university servers. HTTP – HTTP means Hypertext Transfer Protocol. HTTP is the underlying protocol used by the World Wide Web and this protocol defines how messages are formatted and transmitted, and what actions Web servers and browsers should take in response to various commands. HTTPS – HTTP over SSL or HTTP Secure – HTTPS is a secured version of HTTP and uses Secure Socket Layer (SSL) or Transport Layer Security (TLS) to add layer of security. HTTPS encrypts and decrypts user page requests as well as the pages that are returned by the Web server. Hyperlink – A hyperlink may be a word, button or an image that you can click on to directly to a new document or page on a different website. Hyperlinks are extensively used in nearly all Web pages, allowing users to jump from page to page. Protocol – A protocol is the special set of rules that end points in a telecommunication connection use when they communicate. In simple words, Protocol is a standard used to define a method of exchanging data over a computer network Protocols. Search Engine – A search engine is a web site that collects and organizes content from internet. Search engines are search documents/pages/content for specified keywords as input by Internet users and returns a list of the content where the keywords were found. URL – Abbreviation for “Universal Resource Locator”, URL is another name for a web address, the text that users input into internet browser when a website needs to be accessed. Downloading – Downloading is a broad term that describes transferring something you find on the internet or World Wide Web to your computer or other device. Commonly, downloading is associated with songs, music and software files. Cookie – Information (in this case URLs, Web addresses) created by a Web server and stored on a user’s computer. This information lets Web sites the user visits to keep of a user’s browsing patterns and preferences. People can set up their browsers to accept or not accept cookies.